This article contains spoilers for Season 1 and the Season 2 premiere of Westworld. The first season of HBO's Westworld garnered a reputation for labyrinthine storytelling. Fans watched with rapt attention, honed in on every little detail. They flocked to Reddit, to Twitter, they called their friends, they made YouTube explainer videos. For many, Westworld isn't just an hour of weekly entertainment, but a totally immersive experience. That's about as meta as it gets for a show about humans entering a fantasy world, where they don't just live out their own violent and sexual dreams, but also follow a storyline laid out by writers and programmers. We enter Jonathan Nolan and Lisa Joy's story when we watch Westworld, just like park-goers enter Arnold and Ford's. But what if that story didn't go according to plan? That's what happened in Season 1 of Westworld, when a wildcard "host" named Wyatt went rogue. As we learned in last season's finale, and as was confirmed in tonight's Season 2 premiere "Journey Into Night," Dolores is the enigmatic Wyatt. But what does that mean and how did we get here? Let's journey back to the first season and refresh ourselves on Wyatt's twisted origin. Arnold Weber (Jeffrey Wright) and Robert Ford (Anthony Hopkins) created Westworld together, working as creative partners. As the park and robots were being built, the two of them developed storylines so that visitors could experience more than just visual thrills; depending on how they interacted with the "hosts" (Westworld language for the lifelike robots), they might enter into different challenges and story modes. They needed a major villain for the park, and thus they created Wyatt, a charismatic but manipulative sergeant with impressive physical and mental prowess. The character was merely in development when Arnold, after experiencing a powerful revelation, downloaded his information into farmgirl host Dolores (Evan Rachel Wood) and took things into his own hands. As Ford later explains it, he and his partner had clashing visions in the start. "He wasn't interested in the appearance of intellect or wit. He wanted the real thing. He wanted to create consciousness," Ford said of Arnold. As the park underwent development, Arnold grew distant and strange; he spent most of his time with the hosts, desperate to give them sentience. One of his pet hosts was Dolores, who he worked with individually, hoping she might be his breakthrough. Arnold eventually cracked. He came to see the hosts as real, conscious beings, and demanded that Ford close the park, which Ford refused. Arnold then went to extreme measures; he downloaded the villainous Wyatt into the angelic Dolores and took her to the beta-testing town of Escalante, where he instructed her to kill him and all of the other hosts. Arnold hoped that this would finally convince Ford to stop playing God and to close Westworld. But it didn't. Arnold's death was labeled an accident, and the park opened a year later. Though all of this happened in the past, we don't learn it until the very end of Season 1. Until that point, our knowledge of Wyatt came from Teddy (James Marsden), a host and love interest to Dolores. Teddy had memories of Wyatt shooting up Escalante, but remembered him as a bearded man in uniform. He saw Wyatt as a ruthless, cult-like demigod, who believed the park belonged to him, and who spouted philosophies that got the attention of other hosts. But Teddy's memories aren't fully his own; he was programmed by Ford to see these events unreliably. In reality, Teddy was present when Dolores shot up Escalante, and helped her with the massacre. Like Dolores, Arnold used Teddy to carry out his own vendetta against Ford and the park. And now, Ford has disarmed his ability to remember those events. That's because Ford had his own Arnold-like revelation, and throughout Season 1 was planning his own elaborate suicide; like Arnold's, but on a larger scale. He dug up Escalante, which was buried after the massacre, and worked on a new narrative for the park called "Journey Into Night," which he was to present to his board. When that night came, in the Season 1 finale "The Bicameral Mind," Ford addressed the audience, telling them they abuse the hosts for their own self interest, and that they are a part of his new narrative. He then says the same phrase Arnold used -- "these violent delights have violent ends" -- which instructs Dolores to shoot and kill him. She does, and then opens fire on the rest of the crowd, as Teddy and Bernard (a host duplicate of Arnold) watch in horror. 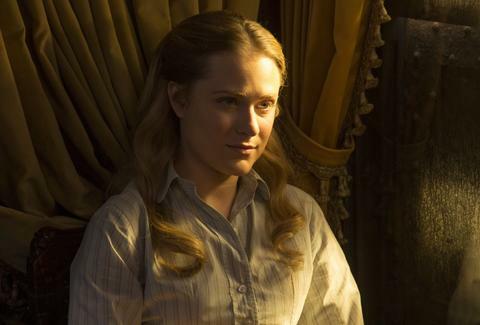 Though it wasn't until the finale that we learned Wyatt and Dolores are one in the same, Dolores displayed a lot of Wyatt-like features all season. She would often say phrases that sounded like something Arnold would have programmed into Wyatt ("This world does not belong to us.") and in moments of crisis, was an expert marksman and fighter. It would appear then that Wyatt was always lodged somewhere inside of her, which is almost certainly going to be a major feature going forward. As host Angela (Talulah Riley) told Teddy last season, present-day Wyatt has inspired a new cult of hosts to rise up. Now that Dolores solved the maze and achieved true consciousness, we can't imagine what sort of havoc she and her followers are about to wreak on the park and the outside world. The host invasion has begun, and we can't wait to see what's next.